The Knicks won their second in a row last night, 120–116 over the Nets, and if we were a peaceful, honorable soul, we'd just stop this post right now, and we could all go enjoy our waffles. After all, the Knicks are now only one game under .500, two games behind Philadelphia for the No. 6 seed and have a magic number of three to clinch their first playoff berth in seven years. This is all good news! So then, let's just forget the first half of last night's game and move on. Look, butterflies! Alas, we can't: The Knicks, supposedly invigorated by the win over Orlando on Monday, came out flat, tired, and bored against the Nets last night. Again. The major issue was rebounding; never have Kris Humphries and Johan Petro looked so much like Dennis Rodman. The Knicks were outrebounded 30–17 in the first half, and it felt even worse than that, and at one point, the Nets were up sixteen points. The Nets. (Even with Deron Williams back in the lineup, and looking terrific.) Observers have been criticizing the Heat all season for turning their intensity on and off at will, and while those observers have a point, the Heat have at least won 52 games this year. The Knicks have won 37. Where do they get off taking anything easy? Regardless, that usual level of "wait, they know the game started, right?" was as frustrating as ever, but the Knicks ramped up the intensity in the second half, particularly Carmelo Anthony, who had his best game as a Knick for the second time in a row. He scored 39 points — including a beautiful third quarter, with one of those patented "holy crap here he goes" scoring streaks that he often searches for in vain the rest of the game — and played aggressive defense throughout. (But boy, is he ever handsy. 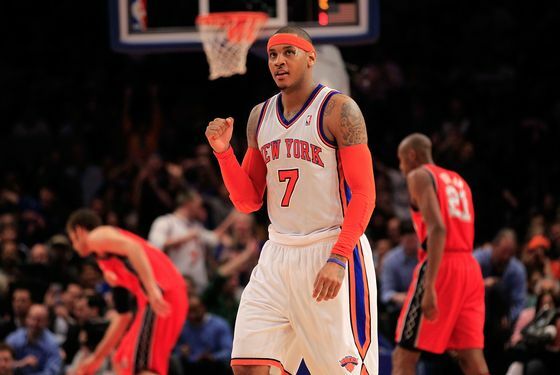 If he weren't Carmelo Anthony, he'd be called for about fourteen fouls a night.) Amar'e Stoudemire had more energy than he has of late as well, and Chauncey Billups scored 33 points on 23 shots, at least fourteen of which made you want to run out on the court and strangle him, whether they went in or not. The Knicks scored 120 points. Anthony, Stoudemire, and Billups scored 95 of them. The effort is still not consistently there, though to be fair, it's almost April, with two weeks left in the season, and every team is flagging a bit. What the Knicks need more than anything else, though, after their exhausting month, is some time off. With no games until Sunday, when they play the Cavaliers for what seems like the 94th time this season, that's exactly what they're getting. Take a deep breath, enjoy some baseball, and take a few days off. After this crazy month, we're sure you need the rest almost as much as they do.